I really love soup. It's the perfect main dish for lunch or a lighter dinner. Almost every time I make homemade soup I make sure there's a fresh loaf of bread to go with it. Both of my kids like to dip the bread in their soup, so it's a perfect way to get them to eat a little more of those soups that they're iffy on. They think they're playing with their food, and I think they're eating more of the good stuff. It's win-win! This particular soup is a very quick one to put together. It's the perfect comfort food on a cold winter day, but is also awesome in the summer. The dill and potatoes remind me of the most delicious combo out of my grandma's garden in the summer. So I make it year round. 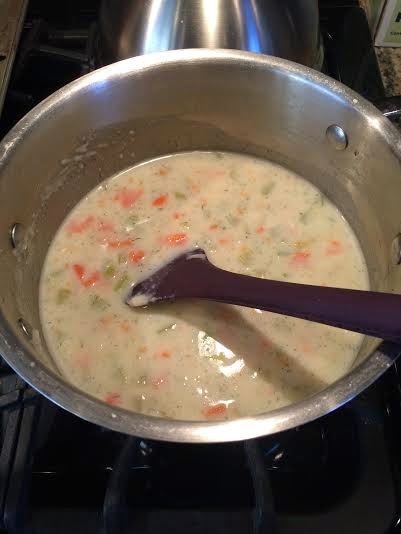 This recipe was adapted from "Hearty Potato Soup" from Taste of Home. I've made a few changes for my liking (adding dill, using broth vs. water, and tweaked some quantities). You can find the original recipe here. Place potatoes, carrots and celery into a large pot with broth. (Note that I've tried this soup with purchased broths, homemade broths, and broths made with bouillon cubes. It works well with all). Bring to a boil and simmer until tender (about 20 minutes). Strain the vegetables, saving the broth in a large bowl. Melt the butter in the same pot used to boil the vegetables, Stir in the flour to make a paste. Gradually whisk in the milk, stirring constantly until thickened. Season with salt and pepper, and add dill. At this point I take a potato masher and lightly mash some of the potato and veggie cubes in the soup. This step isn't necessary....it's just my personal preference to have them broken down a little bit more. Your soup will be very thick at this point. Add as much reserved broth as you would like to get the consistency you're looking for, and heat before serving.